Although Turbo Your PC software is distributed in a fancy wrapping of purportedly efficient system optimization, it is a rogue and should thus be uninstalled. Computer health does not go hand in hand with Turbo Your PC application, despite the fact that the publisher of this product is trying to convince people these concepts are a perfect match. Things may appear serene at first sight: the program’s official page reflects best practices of web design, with reassurances about all-around recognition of its quality and trustworthy-looking references. Upon closer scrutiny, though, none of the above turns out to be genuine. The utility claims to do a lot more than it can actually cope with. 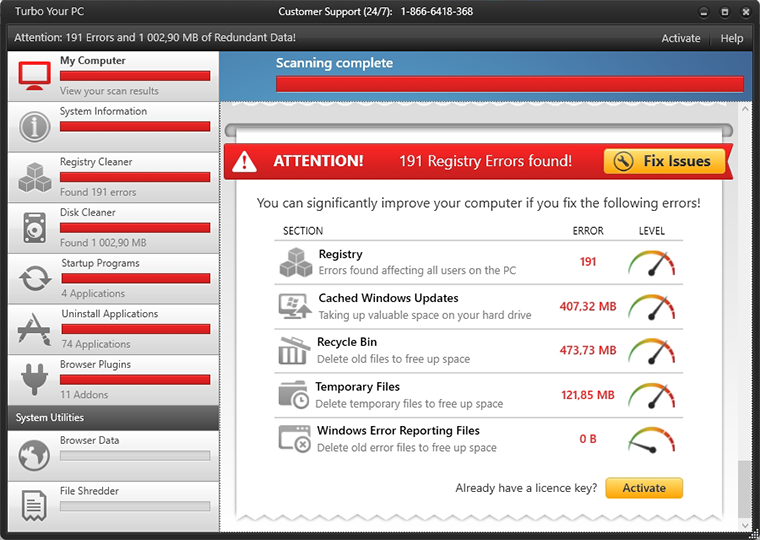 What’s worse is it comes up with errors that do not exist as it runs system scans. This is a trick used for encouraging license purchases in return for fixing imaginary problems. 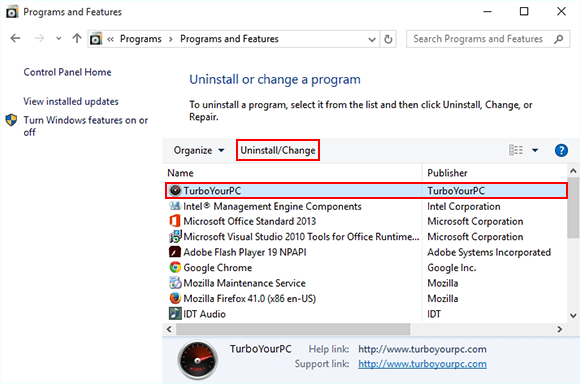 First and foremost, most instances of Turbo Your PC installation are unrelated to things like user agreement and straightforward setup steps. This process, in fact, involves open-source software that can only stay afloat owing to drive-by entities that get pushed along the way. Various application download resources on the web, including the generally trusted ones, host tons of solutions that furtively drag other programs into PCs. In these cases, people are usually one tiny checkmark away from malware issues, so it really matters which terms and conditions freeware installation wizards mention in small font. Having imitated a system error checkup session, Turbo Your PC returns scan results that will always list a bunch of issues, even if the OS has just been installed. The app says it can significantly boost system performance by fixing registry problems, erasing cached Windows updates, clearing temporary files and emptying the Recycle Bin. Getting this job done, however, implies paid registration, which is basically the entire gist behind this potentially unwanted product. If the user tries to exit out at this point, they get additional popups emphasizing the importance of the cleanup. It gradually becomes obvious that Turbo Your PC attempts to manipulate the user’s desire to keep their machine running smooth. It reports questionably accurate data in order to get paid. After closing the app’s GUI, the admin will be encountering further notifications at random intervals. These include system tray messages and popups that blatantly interrupt the regular computer use. 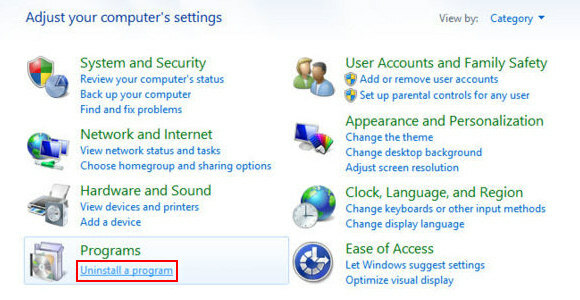 Every reboot will also be accompanied by these reminders as well as new, automatically triggered scans – this is because the software becomes a part of the OS startup configuration and is permanently running in the background. 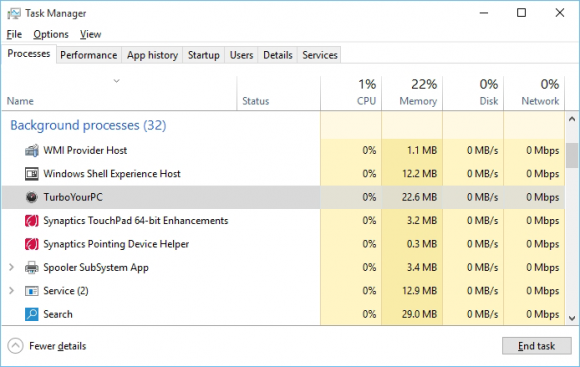 The executable may cause memory usage spikes once in a while, making the machine operate slower or freeze. 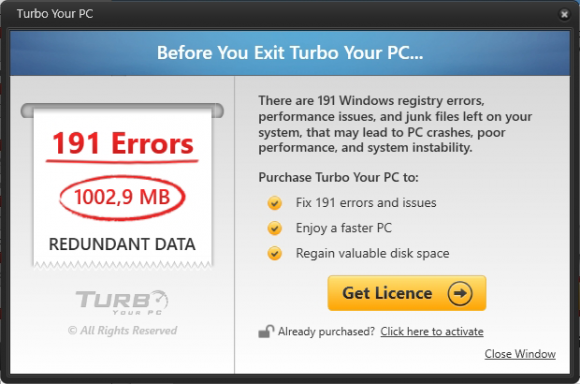 There are too many question marks next to the effects and objectives of Turbo Your PC. It annoys and misleads users, not to mention the unfavorable influence on system performance. Removing this bogus optimizer is undoubtedly the optimal way out. Whereas manual uninstall may not be efficient enough under these circumstances, the cleanup using automatic security software guarantees a proven fix involving little user effort and a trouble-free procedure. When the software returns a list of malicious and potentially unsafe items found on the PC, select Fix Threats in order to have the Turbo Your PC infection uninstalled from your machine. An additional virtue of this process is the elimination of other threats that may be active in the background. Due to article in Yahoo, signed up for yourturbopc. Enteredicense code, got invalid. Called number listed, got someone named Ahmed. He got the program installed, then poceeded to tell me that there was so much wrong that they would have to clean computer at a cost of $99.00. Hung up on him. Called another number which was evidently a number for Microsoft. Got a guy in Orlando, FL who at least spoke english. He informed me that my computer was completely shot. That all microsoft ware is gone and to buy a new computer, or, they can clean it out for $150.00. This is a bunch of b.s. I was charged $17.90 when signing up. Want a refund returned to my account.